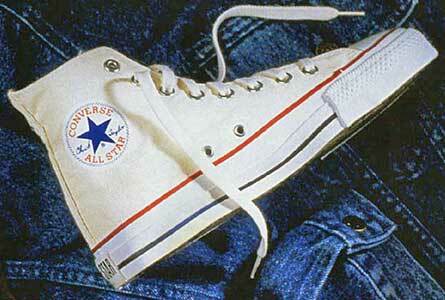 From 1918 to 2000, Converse Chuck Taylor All Stars were manufactured in the United States. I live in Portland, Oregon, where Nike has its corporate headquarters and where the first Niketown store was built, but for the last several years I’ve worn Reeboks. This winter my Reeboks began to give out. It was time to look for new shoes. I started browsing, picking up one spanking clean, aerodynamically designed sneaker after the other and reading the small labels hidden inside: “Made in China”, “Made in Korea”, “Made in Indonesia”, “Made in Thailand.” A few years ago Nike’s overseas labor practices were publicized, and the small scandal that followed made it clear that the foreign operations of a number of U.S. shoe companies left a lot to be desired. My Reeboks were made in Korea, and I promised myself that my next pair of athletic shoes would be made in America. “Do you know if any of these factories are unionized?” I asked. There was a short silence. “I don’t know if they have unions in Indonesia,” he finally said. “Made in the U.S.?” She seemed taken aback. Their shoes are made in Brazil and Asia, she said. When I called Reebok, I identified myself as a journalist, and this time I was transferred to Corporate Public Relations. “All of our shoes are manufactured outside of the United States,” a woman told me. I asked her which countries and she didn’t know. She did, however, send my Reebok’s Human Rights Standards brochure. Artfully designed, done up in red, white, and blue, it uses phrases like “appropriate in light of national practices and conditions” to define acceptable wages and working schedules. It took me several more calls to find out the countries in which Reebok manufactures appropriately — China, Thailand, Indonesia, Korea, and the Philippines. Saucony does manufacture some shoes domestically; the company was, in fact, frequently suggested to me by shoe clerks. But when I called Saucony and identified myself as a journalist, no one would answer questions unless they were submitted in writing. I went back to stores and looked at label — in Filas, Adidas, Avias, Etonics. China, Korea, Indonesia, the Philippines. By now, my Reeboks had a hole in them. Most shoe workers in Southeast Asia are teenagers and young women. They work fifteen- to sixteen-hour days doing endless piece work. (Even Reebok’s space-age brochure mentions sixty-hour work weeks as normal.) Many of these women live away from their families in barracks; in some cases, they are virtual prisoners, forbidden to leave the factory compound without a pass. The minimum wage in Indonesia is now $1.80 per day. And it’s not always enforced. Jeff Ballinger, a labor lawyer specializing in Asian issues, told me that even Indonesia’s minimum wage at sixty hours a week fails to meet the local poverty level. He pointed out that Bata, which makes a variety of cheap shoes largely for the Asian market, pays its workers $3.90 per day — quite a bit more than companies producing for the American market. “How many people work for Nike overseas?” I asked. Peters didn’t know. Nike has only a few hundred actual employees in Asia, he said, many of them in quality control. But on the other side of the middlemen, about 75,000 people make Nike shoes and clothing. Every time I turn on the television, I see Michael Jordan and Larry Bird, Nancy Kerrigan and Bo Jackson and Charles Barkley — ducking and running and skating for shoe companies. When I spoke with Keith Peters of Nike, I asked how much money Nike spends on endorsement contracts. “That number,” he insisted,“is not divulged.” It was widely reported that Nike signed Alonzo Mourning to a $16 million contract just last year. How much does it matter, I wondered, squeaking around the volleyball court in my frayed Reeboks? How easily do principles give way to the pressing need for ankle support? For brand loyalty? For fashion? Manufacturing in the United States is not economically viable. Can’t be done. But New Balance manages to survive, albeit on a scale smaller than Nike. How much would Nike, which had profits of $360 million in 1993, earn if it manufactured shoes here, or simply paid its overseas workers a living? Somewhat less, perhaps. But the company would probably stay afloat. Last week I bought a pair of New Balance 665s with a little label inside reading “USA”. The plain white shoes cost $59.95, and I like the fit. They’re comfortable in several different ways.